Siesta Beach, ranked the Number 1 Beach in America in 2011, is the best known of Sarasota's 36 miles of Gulf Coast beaches. This world-class beach is open every day and attracts millions of visitors each year. We do our best to make your visit to Siesta Beach a memorable one. We've even painted our four lifeguard stands different colors, red, green, blue, yellow, to aid beachgoers in locating where they want to play for the day. It's a good way to remember where youhave picked your spot on the beach when you come back from the beach concessions or the restrooms. So make sure you advise your children as well. Beachgoers need to bring a few essentials. Florida sun is very intense, so sunscreen is a must. 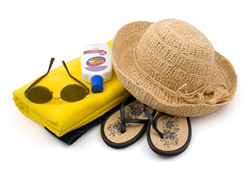 Local drug and retail stores carry SPF 15 to 50. Use it generously. You want beautiful tan not ugly sunburn! You'll also want to hydrate, so bring water or your favorite beverages in cans or plastic container's, Glass containers are not allowed on our beaches. Along with your bathing suit, hat and flip-flips, bring a nice big beach towel for spreading out on the sand. Check our local stores for some great looking stuff. Other area beaches include Lido, Nokomis, North Jetty, Venice and Longboat Key. The skilled pros of the Sarasota County Lifeguard Service are responsible for public safety at Sarasota's six public beaches. To make sure your beach visit is a wonderful experience, we offer some of the guidelines they are gathered over their 30-plus years of keeping Sarasota's beaches some of the safest in Florida. A person can drown in a moment. But drowning and near drowning can be prevented. Anyone involved with the supervision of children needs to be aware of the dangers associated with any standing water. Always try to swim in lifeguard-protected areas. Check the swimming conditions flag before going in the water. Never dive headfirst into the water. Don't overestimate your swimming ability. If you are in trouble, call and wave for help. Never allow children to be alone near a pool, pond or any water source. Post the 9-1-1 number on your phone. If you leave the pool area, take children with you. Always have a responsible designated child watcher around the water. Learn to swim and teach children to swim. Florida averages about 10 lightning-caused deaths a year. Most were in open areas like beaches. Few people realize that lightning can strike as far as 20 miles away from a thunderstorm, even when the sun is shining. Lifeguards will close all swimming and beach areas well before a storm arrives and following a thunderstorm. Inside your car is the safest place if you are at the beach during a thunderstorm. These winds (also called Island breezes? flow easterly from the land to the Gulf. The wind can push people with floats, tubes or beach balls away from shore and some, especially children, will have trouble getting back to the beach against the wind. They may become exhausted in deep water and need help. When a wave breaks directly on the beach it'sd a shore break. The force of such waves knocks people down and can even cause injuries. Lifeguards are available to assist anyone who needs help entering and exiting the water. Rip currents are dangerous water conditions that can suddenly sweep unsuspecting swimmers out to sea. They form during high surf and strong westerly winds, causing waves to push large amounts of water onto the beach. As this water starts to recede, it becomes a current moving away from the beach. Rip currents vary in size, speed and strength. Some dissipate close to shore, while others can travel for several hundred yards off shore. To escape rip currents swim parallel to shore until you are out of the current or float until the current dissipates. Then swim diagonally to shore. Lifeguards advise: If in doubt, stay out! The Gulf of Mexico is home to diverse marine life. Beachgoers most commonly encounter jellyfish and stingrays. Jellyfish come in many sizes, shapes and colors, but all have stinging cells called nematocysts for defense and feeding. Their tentacles have thousands of these stinging cells and activate when they make contact with swimmers. They usually leave welts and rash-like red skin with a prickly or burning feel. Don't rub or scratch if you are stung-it only makes matters worse. See a lifeguard. Treatment involves rinsing the affected area with household vinegar. Symptoms usually subside within 15 to 20 minutes. Stingrays are not aggressive creatures. In summer, they tend to burrow in sand near the shoreline to mate or search for food. Because they are hidden, bathers can't see them and consequently step on them. The stingray reacts by swinging its tail, striking with its barb and causing a wound to the foot, ankle or lower leg. Its venom causes almost immediate, intense pain and if not treated will spread up the leg and to the body. Get immediate help. Soaking wound in hot water will inactivate the venom and relieve the intense pain. Find a lifeguard or go directly to the nearest medical facility for treatment. If you do go into the water, slide your feet along the bottom as you walk. The "stingray shuffle" alerts the stingray and he will swim off out of your path. The beach and pool are so much fun that it's easy to get distracted or confused in unfamiliar surroundings. Do some simple advance planning. Pick a central location and a time to meet, just in case someone does get lost. Set up a bright umbrella or object to easily identify your home base? Establish a secret password with your kids in the unlikely event strangers should try to lure them away. Remember what clothing children and adults are wearing. That could help in a search. If someone does get lost, the first rule is to remain calm. Go to the nearest Lifeguard station. A lifeguard will notify other lifeguards by radio. If you're at a beach with no Lifeguards, try to orient or identify your beach location, perhaps from another beachgoer. Call 9-1-1 or ask someone to call 9-1-1 and give your location. Try to identify where the lost person was last seen. Planning ahead will help keep your time in the sun a totally fun experience. In Sarasota County each lifeguard office has its own lost and found procedures for holding and tracking items lost on the beach. On all beaches when an item is brought to a lifeguard stand it may stay there until the end of the day. Maybe the owner of that wallet, cell phone, or key will return to ask for it. If not, the item will end up in the lifeguard office waiting to be claimed. Because so many people visit Siesta Beach, many more things are lost and found. So the process is different. Usually the found item is turned in at a lifeguard stand or maybe to the Beach Ambassadors. If not claimed by the end of the work day the lifeguards take it to the Siesta Beach Parks and Recreation Office. It gets inventoried and stored according to date. There it waits until claimed. If you find a personal item on the beach that could be lost, please take it to a lifeguard station. Sarasota County Lifeguard duty hours: Beach lifeguards will be on duty from 9 a.m.-5 p.m. daily on Sarasota County's public beaches, which are Lido Beach, Siesta Beach, Nokomis Beach, North Jetty Beach, Venice Beach and Manasota Beach. For information about lost and found items contact Sarasota County Lifeguard Operations at 941-861-5000.